At the airport. 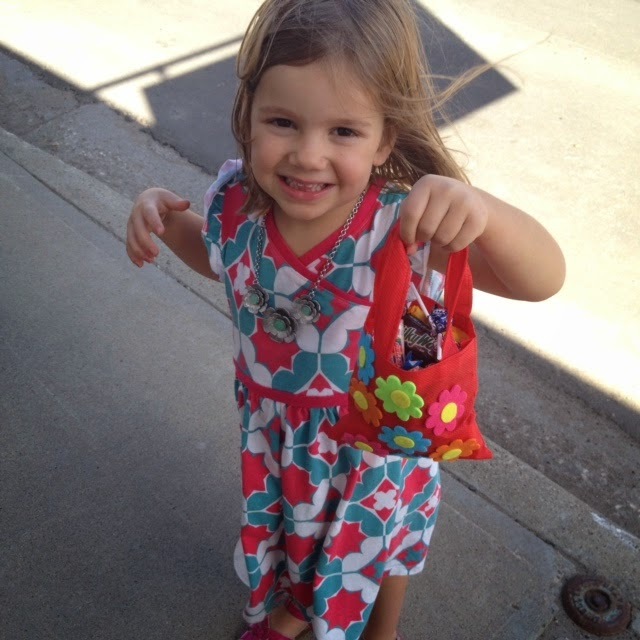 This girl is SUCH a joyful traveler! And a good one, too. Lots of practice. My folks, aunts, and uncle were making the trip, so what the heck. I decided to bring Charlotte and go too. My parents have bought some acreage there and intend to build a prairie house to retire. (Know anyone else retiring in South Dakota? Me neither!) My dad, being a builder and all, had to first build his shop. So, never one to think small when manliness is involved, he built a shop connected to a large garage and then A FREAKING HUNTING LODGE upstairs on top of it. The lodge has a bedroom, full bathroom, kitchen, living room (with flat-screen TV of course), and an upstairs deck. I have to admit, I was rather stunned at my dad's attention to domestic detail. Considering that I have never seen him wipe a counter or not swear at a decorative toss pillow, I was genuinely impressed by the moose toothbrush holder, the wildlife dishes and mugs, and--the kicker--pheasant-engraved wine glasses. My uncle (my dad's brother) and aunt arrived from Eastern Washington with their horses. My Aunt Jane (my dad's sister) and her husband also arrived. Let me tell you how remote this place is. We flew from DC to Minneapolis. We then caught a small plane to Bismark, North Dakota, at which point you already feel like you're in the middle of nowhere. We then drove for 2.5 hours FURTHER into the ACTUAL middle of nowhere, to my folks' property. The camera on my phone does not do this view justice. I took this in the morning, and there was such a pretty early-autumn golden glow. Most of this area's Dakota prairie is flat, but my parents opted for some rolling knolls, which are particularly pretty when morning fog lingers in between swells. The night we arrived, my folks had everyone--lots of local family, too--over for a BBQ. Fact: My Aunt Jane makes a killer margarita. Fact: The Opp womenfolk polished off a whole bottle of tequila. Fact: I learned my mom is a master at beer pong--a skill she honed hanging out with my brother and his frat buddies. Reading Little House on the Prairie in a little house on the prairie. 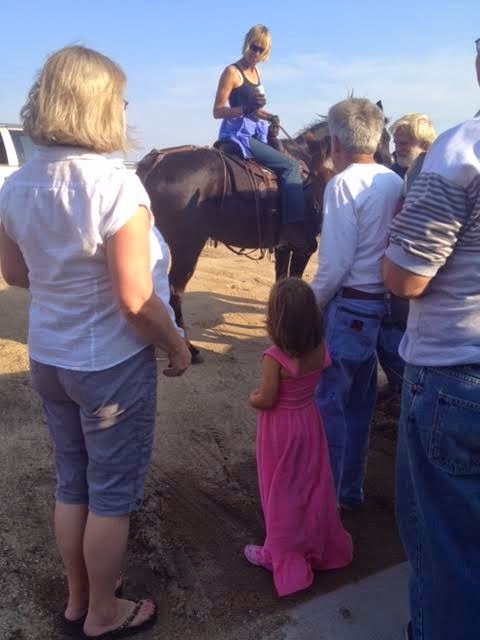 harlotte liked seeing horses up close, but she didn't have the nerve to sit on one. Don't you love how she adds a splash of pink to any given scene? At one point, we went over to my dad's cousin's house for dinner---fish my dad and him caught, potatoes from the garden . . . country life was growing on me. On the day of Schmeckfest, we went to town (about a 25-minute drive). 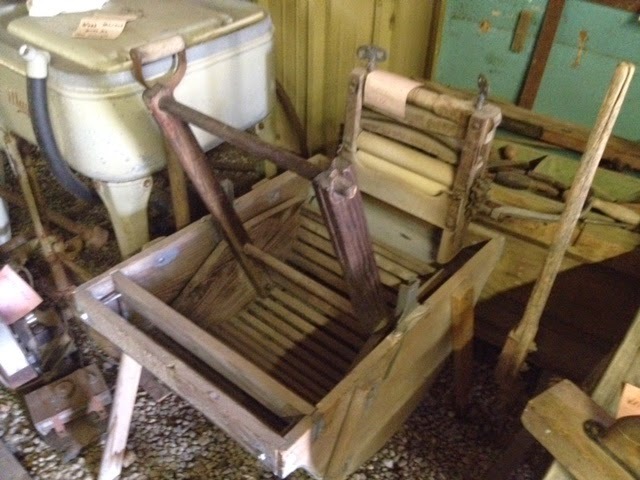 We went to the local pioneer museum, which was demonstrating such trades as rope making and butter churning. An elderly woman named Lorelei (see, this town is GERMAN) was making rugs. 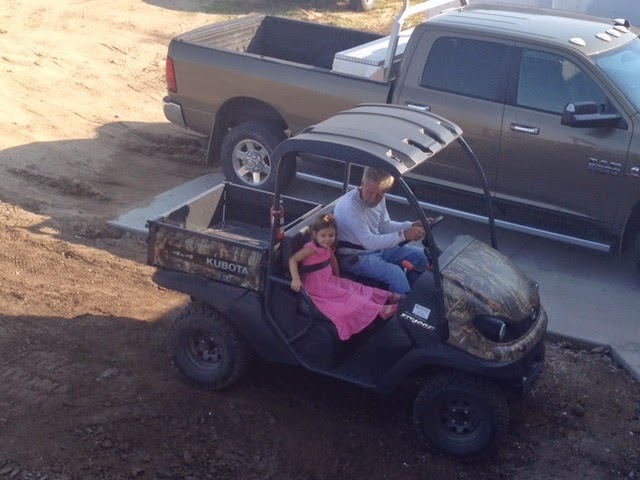 Charlotte picked one out for Papa's lodge. At the pioneer museum. I prefer my high-efficiency Kenmore. After lunch, we watched the parade. 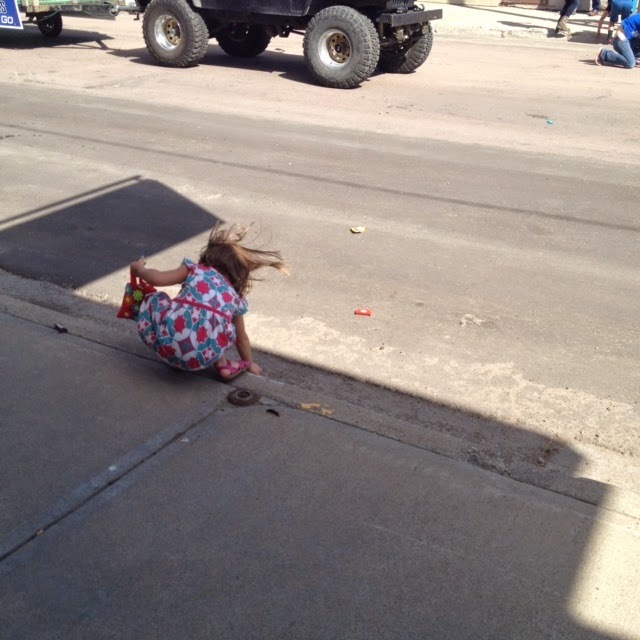 It lasted about 5 minutes, but Charlotte thought it was AWESOME because everyone in the parade tossed candy. Seeing as how the entire town consists of only about 7 children, there wasn't much competition, so Charlotte obtained about 30 pounds of candy. 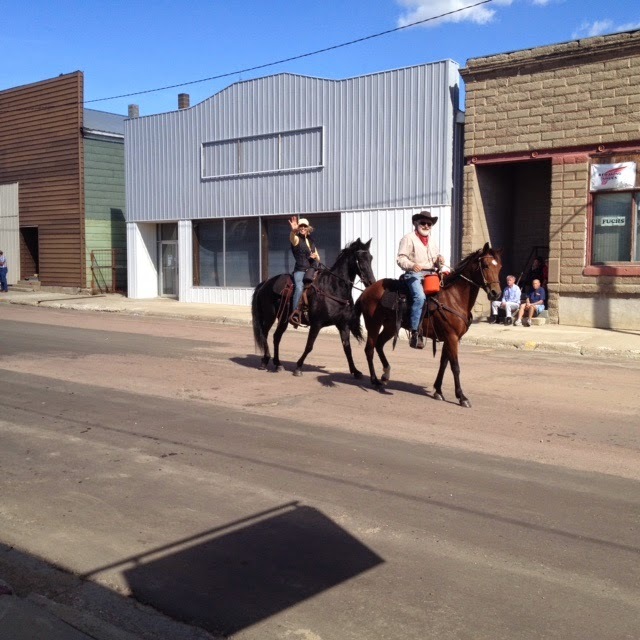 My aunt and uncle (the ones with the horses) were roped into being in the parade, so they rode the horses down main street (I think it might literally be Main Street). 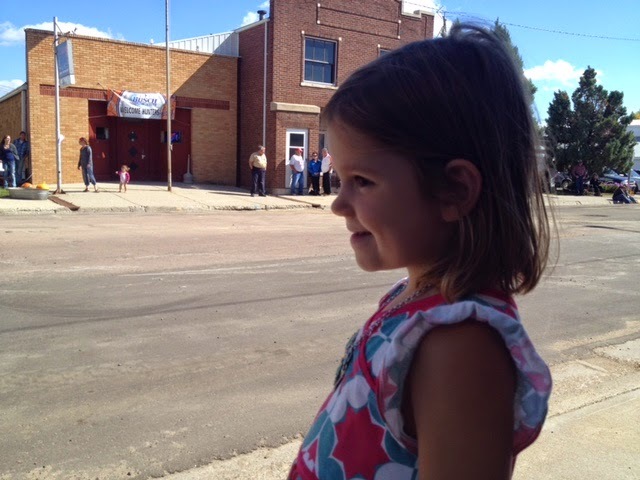 Charlotte, who REALLY took to both my Aunt Jane and Aunt Eloise (and they were so, so sweet to her), was SO excited to see people she knew in the parade. She lit up, squealed, and waved like a maniac. Watching the parade. Isn't she cute? My aunt and uncle in the parade. That night, there was a German meal at the high school--sausage and kuchen and some sort of dumpling I couldn't identify but liked. The prayer before the meal (yes, at a public high school---there are no rules in Dakota) was half in English and half in German. Then we watched an oompah concert. 99% of the attendees were over the age of 75. When the singers/accordion players asked the audience to sing along to this or that song--IN FREAKING GERMAN--the whole audience was able to sing along (except for our table). The ability of a roomful of sober, taciturn people to belt out the words to a German drinking song--in German--was entertaining, but it also made me a smidge sad. This town is in one of the oldest (population-wise) counties in the country. The people--and all the culture and history and soul they contain--are literally dying out. Charlotte was the only child at this event who wasn't related to the performers. Our table was BY FAR the youngest. And this was among hundreds of people. At the end of the concert, there was a slightly pandering, overly earnest medley of patriotic songs, which Charlotte enjoyed, because of the flag waving. And they had everyone in the packed gymnasium who was a veteran stand up at one point. I'd estimate a good 75% of the men stood up--it was quite striking. By now we were way past Charlotte's bedtime. No matter. We all headed down to the local bar where Charlotte, being related to event organizers and all (seriously, we're related to EVERYONE in this town), got herself into a 21-and-over event of more oompah polka music. And so she danced and danced and danced. "Just like Cinderella at the ball," she said dreamily. Um, yeah. Totally. Fact: After the 50th polka waltz, you realize they all sound the same. On Sunday, folks came over to watch the Seahawks game. And that was that. I enjoyed getting to see relatives I rarely get to see, and this was my first time being in Dakota during autumn--so far my favorite as far as the coloring (those golds!) goes. 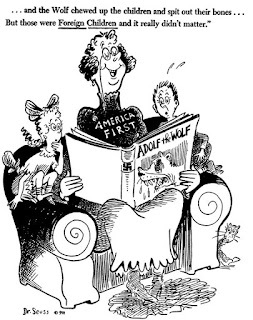 It was good for Charlotte--she needs to know her roots. It was good for me, too. Dakota is a very strange, distinct place---one that is often mythologized or written off, and neither approach comes even close to capturing its complexity. It's a place where a wandering toddler could be lost forever in tall grasses, a blizzard out of nowhere could wipe out a generation of schoolchildren walking home, where dirt poor people could build a life if luck and health stuck with them. It's a place where many children were denied childhoods or killed by nature, with the alternative meaning no shelter, no crop, no food for anyone. A cow worth going out into a blizzard to save. Oh, and should we talk about Wounded Knee? Do you see my point? Dakota is a weirdly complicated place, full of people who don't like to talk about themselves, complain, or drink imported beer. That quietness worries me, though. As they age and die . . . what stories are they taking to their graves?